A 3D printing startup based in California is touting a new additive manufacturing system that is a potential game-changer for the manufacturing industry. 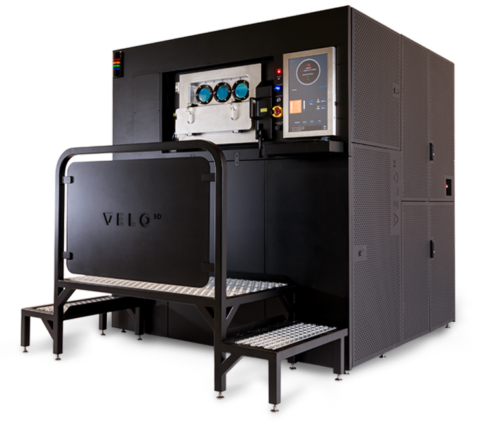 This innovation has been kept under a tight lock and key for the past four years, but Velo3D has recently unveiled the Sapphire System, a metal 3D printer that is able to mass produce components for both the medical and aerospace industries. Velo3D has managed to raise $90 million since it was founded back in 2014, the company says its end-to-end metal additive manufacturing solution has the ability to create complex geometric angles that no other printer is able to make right now. The machine is also able to include steep overhang angles and large internal cavities without the need for supports. As of now, those in the 3D printing community are baffled as to how the Sapphire system is able to pull off these highly complex builds, but many suspect a robotic system that reorients the build platform and deposition head during the process. Velo3D has stated that the printer contains Intelligent Fusion technology which uses real-time layer deposition monitoring. This makes it possible for the Sapphire to change the laser intensity and control the melt pool on the fly. If this technology can live up to all the claims that Velo3D has made it will certainly be revolutionary for the medical and aerospace sectors. Only time will tell to see if other industries pick up on the Sapphire printer, but with the rapid adoption of additive manufacturing throughout the world, it wouldn’t be a surprise. For a more detailed look at this printer check out all of the details on the Velo3D website and for more on the manufacturing industry keep checking back with us here at Manufacturing Talk Radio.